Back in April, Google removed the SMS feature from Gmail Labs. 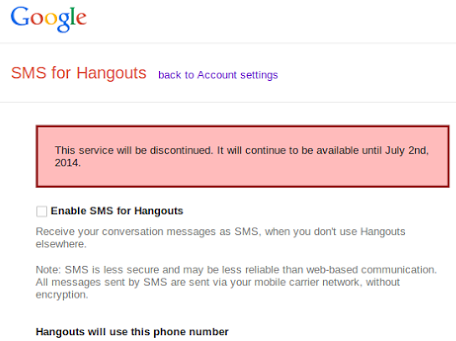 Now SMS for Google Hangouts is discontinued. Here's how Google described the feature: "If you enable SMS for Hangouts, you'll receive messages even when you're not connected to the internet. Messages will be delivered to you as SMS and you can reply by SMS to continue the conversation." SMS for Hangouts was released in May 2013. Google informs that "this service will be discontinued. It will continue to be available until July 2nd, 2014." Apparently, this is the settings page for SMS for Hangouts, but it doesn't work for me. All I get is this message: "We're sorry, the feature you are looking for is currently only available in a limited number of countries." It's important to keep in mind that this has nothing to do with the SMS feature from the Hangouts app for Android. You can still send and receive text and multimedia messages in the Hangouts app. SMS for Hangouts only allowed you to receive Hangouts messages as SMS and to reply by SMS. SMS is a method that has been used from long time by businesses to promote their products or service. Bulk SMS is by using SMS gateway helps them in sending huge number of messages to a large number of people within seconds. Thanks for sharing this detail, your blog post is really very informative. Bulk SMS providers Indore is the very good service give and i get more profit through use of this service. Thanks for sharing such a good information about Bulk SMS In India . It is very helpful for all as we know that in this modern era traditional way of marketing is not enough successful. Bulk Sms is latest tool of promotion and publicity in short time.